Realistically, the last thing we need in 2017 is another addition to the Ocean’s franchise — my apologies to Matt Damon, George Clooney, Brad Pitt, and the billion other men in that franchise — but with the flipped-script Ocean’s 8 starring women, another addition to the heist franchise might be exactly what we’ve been waiting for. 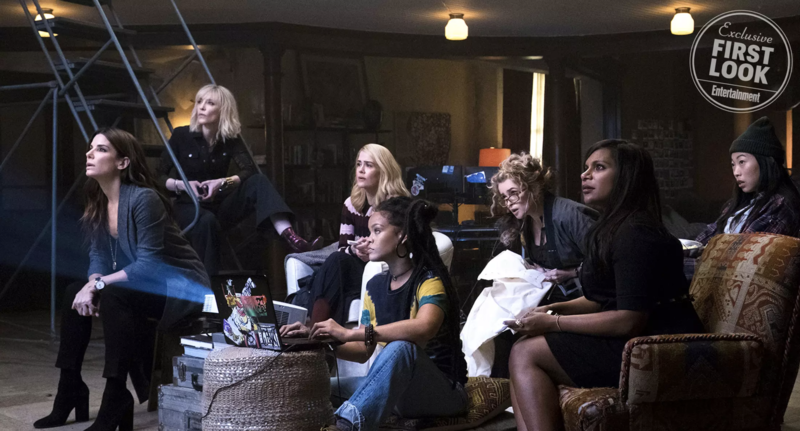 The Sandra Bullock-led Ocean’s 8, which boasts Cate Blanchett, Helena Bonham Carter, Anne Hathaway, Rihanna, Mindy Kaling, Sarah Paulson, and Awkwafina, follows Debbie Ocean (Bullock) — the estranged sister of Clooney’s Danny Ocean — who, following a stint in prison, puts together group of women to pull off a heist during the Met Gala. Speaking with Entertainment Weekly — which also released an ah-mazing new still from the film — Bullock opened up about the film’s intense secrecy, which she likened to a Marvel movie, and how the stars of the film pushed back against the sexism they face as women making a heist film. Bullock revealed that being on the set of Ocean’s 8 with a cast of primarily women was incredible. Not only because she was she able to spend time with crazy talented ladies, but also because being on-set and in the make-up trailer and just talking to each other about seemingly normal topics, like kids and work, made her realize exactly how isolating sets can be for women when they’re largely outnumbered by male cast members. The Blind Side actress also noted that it was interesting comparing how male-dominated films are treated versus female-dominated films. "It was so great. I would say, isn’t that funny how with the guys, I don’t remember ever hearing anything about potential discord. But you so get it with women," Bullock said. "If there’s ever more than two women in the film there’s rumblings of, 'oh, they’re having cat fights.' There was nothing, because I think because of the unique situation of this and because we all are trying to achieve the same thing, we bonded pretty quickly out of necessity and just because we like each other." Ocean’s 8 is slated to hit theaters on June 8th.